The International Biennale Artist Exhibition showcases a community of well-established artists, whose artwork serves to express cultural diversity, while creating a universal dialogue of creative expression. This collection of artworks, displays a varied understanding of technique, media, and subject matter, while typifying contemporary trends in the international art world. Many of the artists featured have been recognized through various awards and distinctions, and each artist has endeavored to communicate to a broader audience, creating artworks that have been exhibited and collected worldwide. 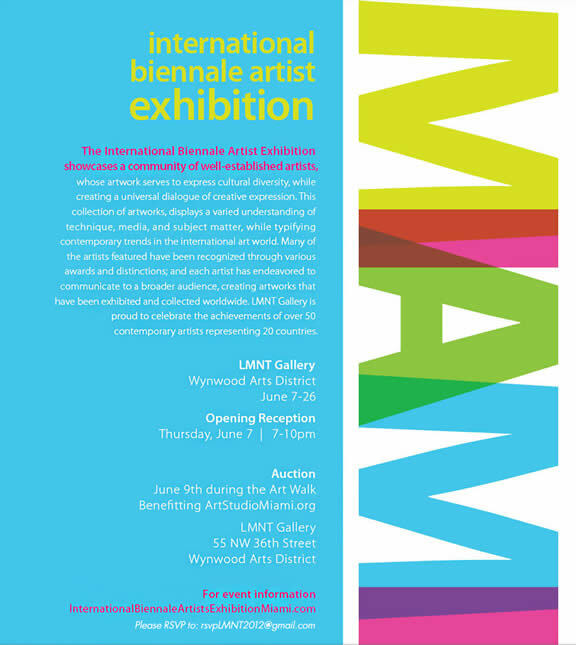 LMNT Gallery is proud to celebrate the achievements of over 50 contemporary artists representing 20 countries.